Russia Tries To Regain Control Of Space Capsule : The Two-Way The cargo ship was launched Tuesday and scheduled to dock at the International Space Station to deliver 2.5 tons of supplies. Ground control lost contact after the ship reached its first orbit. 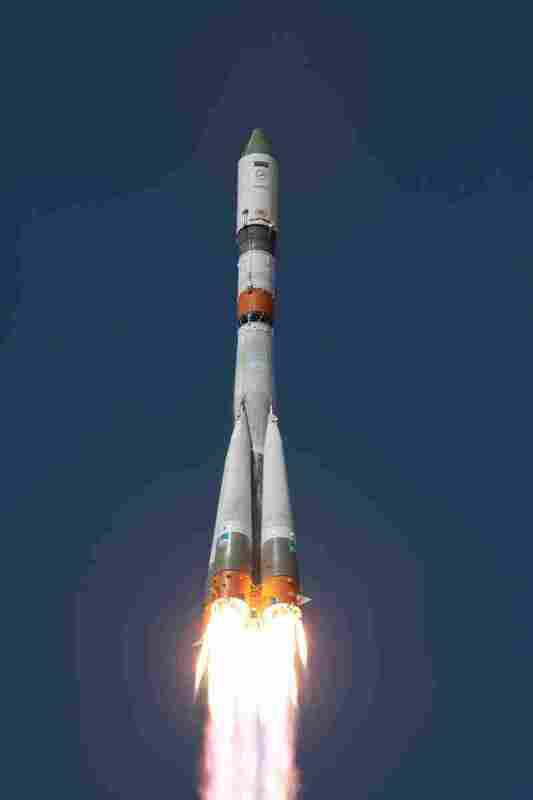 A Russian launch vehicle carrying the Progress M-27M cargo ship lifts off from the Baikonur cosmodrome in Kazakhstan on Tuesday. Fears mounted Wednesday that the unmanned cargo capsule was lost and may plunge back to Earth as ground control failed to gain control of the orbiting ship for a second day in a row. Russia's space agency is trying to save an unmanned cargo ship that spun out of control on its way to the International Space Station. The capsule, dubbed Progress M-27M, was launched Tuesday from Kazakhstan and scheduled to dock at the International Space Station six hours later to deliver 2.5 tons of supplies, including food and fuel. Ground control lost contact with the ship after it reached its first orbit. NPR's Corey Flintoff tells our Newscast unit that "means they haven't been able to send it the commands needed to boost it into a position where it can rendezvous with the space station." NASA, in its latest update Wednesday, said "docking has been called off" for the spacecraft. "Russian flight controllers are continuing to assess the vehicle and what the plan going forward will be," the agency said. Russia's state-run RIA Novosti news agency quoted an unnamed source as saying an attempt to contact the craft Wednesday ended in failure. No further attempts are expected Wednesday, the source said. "To be honest, only a miracle can save the ship. There is no telemetry, and the spacecraft has not been able to get out of its spinning and be stabilized, so a maneuver involving distance or manual docking is becoming extremely dangerous," the source told RIA Novosti. The news agency added that the craft is expected to enter the Earth's atmosphere and burn up in about a week. Agence France-Presse adds that the once-proud Russian space station has "recently ... endured a series of setbacks, notably losing expensive satellites and a similar Progress supply ship in 2011. Shortly after launch, the vessel crashed into Siberia, marking one of Russia's biggest space setbacks."